Madura Gold is quarried in a bedrock quarry formation in India. Last week's Slab Sunday was Kashmire White granite, which comes from the same quarry as the Madura Gold. Kashmire White comes from the lower level of the quarry. The Madura Gold is the top 20 feet of the quarry which has been oxidizing for millions of years. 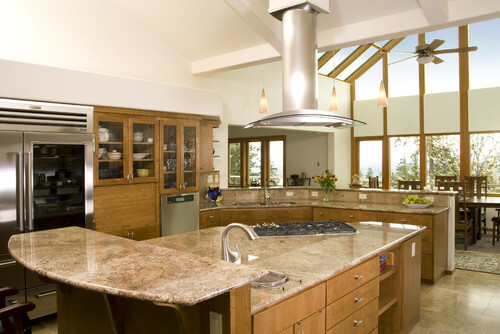 The oxidation is what turned the Kashmire White granite to the warm gold and caramel colors that are in the Madura Gold. Madura Gold is one of our more popular colors that we sell. I think it's because it's a warm, neutral color and the pattern is really easy on the eyes. Also, it goes so well with every different cabinet color from white to dark brown. We have a lot in stock right now for a really great price. Go here for details. Other names for Madura Gold include: Madurai Gold, Golden Oak, Giallo Madura, Gold Star and Madurei Gold. Madura Gold can change quite a bit in coloring and veining from bundle to bundle, so I definitely recommend selecting your exact slabs. Madura Gold is available in 2 cm and 3 cm slabs. 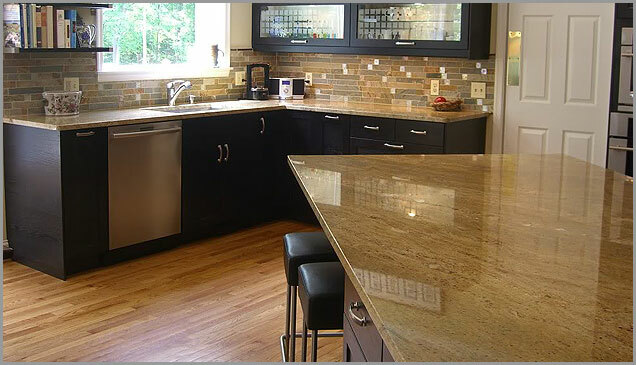 Madura Gold Granite Countertop with black and brown kitchen cabinets enhance the style of entire kitchen and looks prominent. It's Amazing!